The illustrated book ARCHITEKTIER / ANIMAL ARCHITECTURE is published in summer 2013 by Knesebeck. This magnificent volume brings together the most beautiful photos from the project. The book also supplies interesting information about biology and has numerous fascinating stories to tell about animal architects, including their applied construction principles and tricks. A visual delight for everyone who loves Nature. 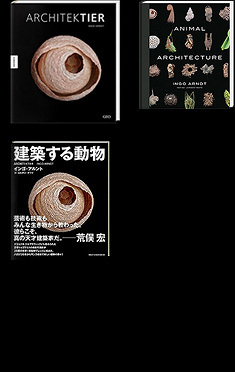 The book is also available in English and Japanese.